The year 2019 represents a high point in the sustainability of Western classical music in India. The first batch of students who were enrolled in the NCPA Special Music Training Programme in 2012 are all set to graduate after seven years of hard work and dedication. Most will continue training for four additional years at the advanced programme offered by the NCPA, thereby creating a group of highly trained musicians capable of sustaining a career in this field. Ultimately, this is one of the main goals that the programme – now renamed the SOI Music Academy – seeks to accomplish. When the Symphony Orchestra of India (SOI) was set up in 2006, only a handful of Indian musicians showed the potential to be trained to match the high standards of a professional orchestra. Recognising the need for a music education programme that the country was sorely lacking, the NCPA launched a Suzuki programme in 2008. “We knew we had to create a music appreciation course prior to officially starting the music school,” explains SOI Music Director Marat Bisengaliev, adding that it was only after thorough preparation, in 2012, that the initiative was replaced by the SOI Music Academy. The five graduating students – Leah Divecha, Nyra Jain, Aaliya Ramakrishnan, Ananya Radhakrishnan and Srishti Sen – were among the 500 children enrolled in the pilot Suzuki project. All of five years old and in kindergarten at the time, none had held a violin prior to this. Yet, all agree that the Suzuki outreach programme sparked an interest in both the instrument and Western classical music. Several years later, they were among the talented students who were selected to join the SOI Music Academy in 2012. They also received advice on which instrument was best suited to them. “Mr. Bisengaliev noticed that I had a wide hand span and that my fingers were long and suited to playing the cello,” says Radhakrishnan, while others like Divecha, Jain, Ramakrishnan and Sen displayed an inclination for the violin. Tutored only by those SOI musicians trained in the Russian Conservatoire method, every student receives one-to-one tuition on their primary instrument for an hour, twice a week. Besides weekly second-study piano lessons, the programme offers group-singing teaching under the Solfeggio method, music theory classes and lectures about the history of music. Solfeggio, a sophisticated form of theory, enables students to look at sheet music for the first time and hum or sing it, much like reading a book. Contrariwise, if students listen to a piece of music, they become adept at writing it down in musical notation, explains Shakir. Students are also encouraged to interact with visiting conductors and instrumentalists at the NCPA, which, she says, is eagerly looked forward to and always a huge success. The graduating students have a lot on their plate. Besides studying for academic tests and finishing school homework, they train at the NCPA and supplement it with intense rounds of home practice. But none seem to have any complaints; in fact, they all agree that training in their respective instruments is enjoyable. As violinist Sen, 15, puts it, “The training is rigorous. In the initial stages, it was hard work and, at times, frustrating. But once you begin to take flight with the music pieces, it is a source of joy. The attention to detail is important – perfect notes, perfect posture, perfect poise and confidence for a performance – all of this matters.” Cellist Radhakrishnan, 14, feels that most often, people lose their appreciation for music in the race to excel at exams. 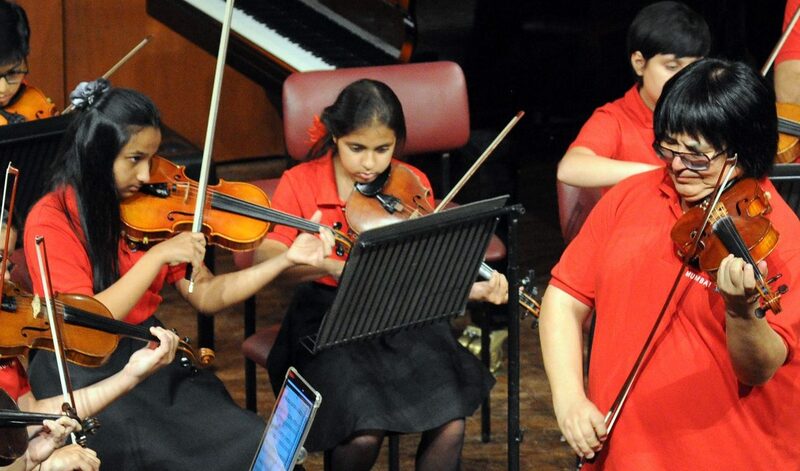 “But the NCPA programme teaches us to not only play music but also to love it, to understand why a piece felt sad, what the composer was going through, and to listen for ways to make a piece different from the way thousands of others have played it. This is why I enjoy every lesson I attend,” she explains. The programme has benefitted 13-year-old violinist Jain in more ways than one, too. “It has taught me how to manage my time well, discipline myself and stay focused over a longer period of time. More importantly, it has helped to make the choice to pursue music as my career. I try to gain the most of what I can from our incredible teachers who devote all their love and time to their students,” she says. Divecha is grateful that the programme has not only expanded her knowledge of music but also given her the ability to express herself. “Music is my therapy whether it be playing, listening to or singing. It helps me escape from the rush of life when I need to disconnect. This programme has taught me what hard work and ‘being tired’ really means. Playing brilliantly at a concert or exam is definitely worth working hard for, no matter how difficult it may be,” says the 15-year old violinist. The SOI Music Academy ensures that all students receive exposure through participation in multiple concerts both within and outside the NCPA. Last year was particularly significant for the budding musicians who made their first international foray at two concerts in Abu Dhabi. “Performing at concerts has given me confidence and I’m now much more comfortable on stage,” says 15-year-old violinist Ramakrishnan, whose takeaways from the programme include an increased attention to detail and the desire to strive for perfection. Later this month, the NCPA will present not one but two concerts that showcase the talent of the students enrolled in the SOI Music Academy. The first, featuring the students’ orchestra, will put forth a series of light-hearted pieces like the Star Wars Theme song among others. Ramakrishnan, concertmaster of the SOI Academy Orchestra, reveals that the audience can expect timeless pieces like Waltz No. 3 by Shostakovich and Bach’s Chorale. The second concert will feature student soloists accompanied by the SOI Chamber Orchestra. “The number of students who can showcase a good standard on stage has gone up and we found it difficult to accommodate them all on stage at the same time in the given time frame,” says Bisengaliev, who will conduct both concerts. Many of the graduating students will continue to train at the NCPA for another four years, while some have expressed the desire to enroll in a conservatory. Whatever be their decision, they are positive that music will remain an intrinsic part of their lives. With a high standard of musicianship achieved at an early age, there is no doubt they will go onwards and upwards in their musical careers. And, if they eventually do make the decision to join the SOI, one can safely say that both the students and the NCPA have come full circle. Students of the SOI Music Academy, will present concerts on 13th and 14th April at the Tata Theatre. This piece was originally published by the National Centre for the Performing Arts, Mumbai, in the April 2019 issue of ON Stage – their monthly arts magazine.